Blue LED inventor Shuji Nakamura draws talent and funding. Three hundred miles south of Silicon Valley, Santa Barbara is on its way to becoming a destination resort for LED activity. Santa Barbara's Soraa closed an $88 million funding round from Khosla Ventures and NEA late last year for its light-emitting diode (LED) and blue laser technology. The town holds the solid-state lighting research at UC Santa Barbara as well as Cree's research lab. Indigenous startups include Soraa, Kaai (bought by Soraa), Inlustra, Nitres (bought by Cree), Uniax (now Dupont Displays), and Transphorm. Transphorm is GaN MOSFET startup with funding from Foundation Capital, Google, Kleiner Perkins Caufield & Byers, Lux Capital, and Soros Fund Management. There are at least four driving factors behind the action in Santa Barbara. First, and most obvious, is the presence of Dr. Shuji Nakamura, the inventor of the indium-gallium-nitride (InGaN) blue LED while at Nichia in Japan. In 1999, UC Santa Barbara lured him away. Nakamura is also a Soraa founder. Second, the materials science department at UC Santa Barbara is ranked number one in the nation by the National Research Council. With a head count of 54, the department is considered a leader in research in gallium nitride (GaN) materials. The department also manages the Solid State Lighting and Energy Center (SSLEC) and the DARPA-sponsored PICO photonics consortium of academics and industry players. The third factor is a local electronics infrastructure, dating back through the aerospace and internet booms. Wikipedia lists Santa Barbara as one of four "Silicon Beaches" (there are 49 "Silicon Whatevers" listed in total). 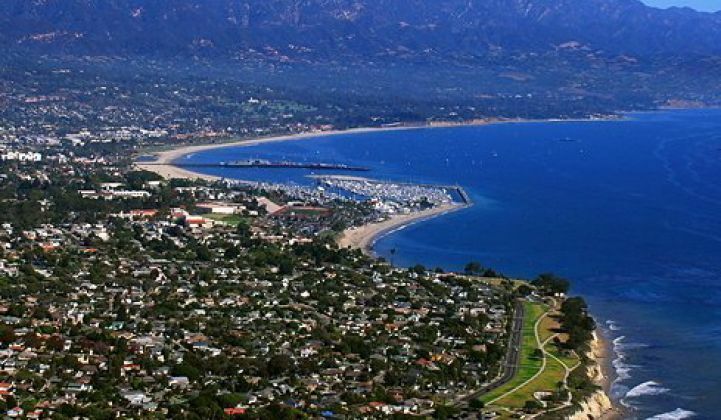 Fourth, Santa Barbara and the surrounding area is beautiful. It seems likely that newly minted PhDs will be fanning out to found more startups in the region. Professors are active here, as well. Dr. Steve DenBaars has cofounded three ventures. He said, “I almost forget about Nitres, it was so long ago -- 1996. But we got a sale to Cree.” The Sandhill Road VCs are a 40-minute turboprop ride away -- not as close as Stanford, but a lot closer than if you're visiting from Cambridge or the Fraunhofer Institute. When will LED activity grow enough to change the character of the area? Alan Salzman of VantagePoint Venture Partners has told Greentech Media that he sees a transformation occurring in lighting, with everything switching out to solid-state lighting and causing "a $100 billion industry to flip." In Salzman's view, the mammoth lighting incumbents like Philips, GE and Osram "might catch up -- or might not." That leaves plenty of room for the city to assert its solid-state lighting identity.